In the early 10th century, the erstwhile ruler of Gwalior, Sodh Dev, a Kachchwaha king died leaving his son Dulha Rai behind whose throne was later usurped by his cousin Jai Singh forcing him to move out. He than started his search for a new territory to rule. During his search he met the chief of Lalsot (a small principality near Amer) who was a non-Badgujar Rajput - the Amer hills were than under the rulership of Badgujar clan of Meenas & Rajputs. The chief of Lalsot was looking for an opportunity to strengthen his position - he saw an opportunity in Dulha Rai and promptly gave his daughter’s hand to him along with a part of Dausa, a neighbouring territory, half of which was controlled by the Badgujars. He soon ousted the Badgujars in some parts of their kingship and declared Dausa as his ruling capital while giving birth to the Dhundara Kingdom which ruled for the next centuries to come over the region. This region was identified as part of Matsya Desh in the ancient literature as the shortest route between north India and the port cities of Gujarat and Malabar. After the death of Dulha Rai, his son Kakil Dev succeeded the throne and seized the hills of Amer from the Meenas and built the temple of Ambikeshwara Mahadev from where the etymology of Amber comes from. He built his capital city at Amber and the kingdom started flourishing. By the 17th century, the Kachchwahas strengthened their position by supporting the Mughal administration who was than ruling the central seat of Delhi of the Indian subcontinent. Raja Man Singh (who was the grandson of Raja Bharmal & made the commander in chief by Akbar of his army after his matrimonial alliance with Jodhabai, daughter of Raja Bharmal) in the 16th century and Mirza Raja Jai Singh in the 17th century contributed to the financial and cultural wealth of the kingdom through their political alliance with the Mughals. The death of Raja Bishan Singh on the last day of the 17th century left behind his 12 year old son Jai Singh who was declared as the ruler of Amber in 1700. He was than called during the same year by the Mughal emperor Aurangzeb as part of the central throne legacy to support him in the Deccan war against the Marathas. He after uniting his army with the help of his ministerial counsels went to the war at Khelna & Panhala in the Deccan. The Emperor was impressed by this young boy-ruler and conferred him the title of ‘Sawai’ which literary means one and a quarter. The major shift came with the death of Aurangzeb in 1907 whose son fought with each other and Shah Alam declared himself the Emperor of Delhi as Bahadur Shah. He broke the alliance with the Kachchwahas and made Amber a part of the Mughal administration renaming Amber as Mominabad. Jai Singh with the help of the ruler of Jodhpur drove out the Mughals from Amber and recovered the terittory in 1710 and since then his power started gaining prominence. The town near the fort of Amber started getting congested in the 18th century and a need for shifting the capital city raised out also to improve the trading economy of the kingdom. He also wanted to make a strong political statement at par with the Mughal cities eyeing to make it a commercial hub of the region. The site selected for the same purpose was a valley located south of Amber and the plains beyond, a terrain that was the bed of a dried lake. The dense forest cover towards the north and the east also left him with limited options. 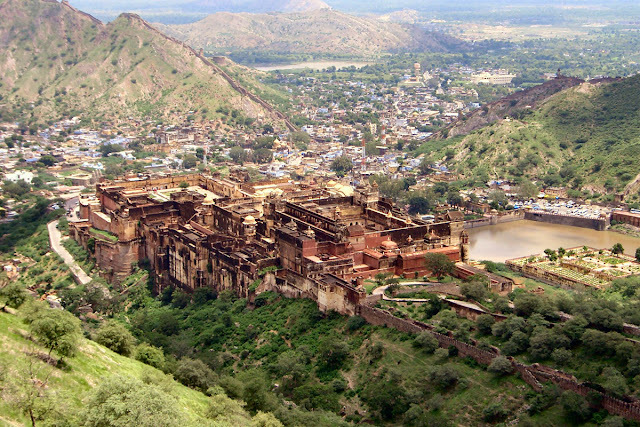 The physical constraints of the city were determined by the location of the fort of Jaigarh towards the north and the sacred spot of Galtaji towards the east. 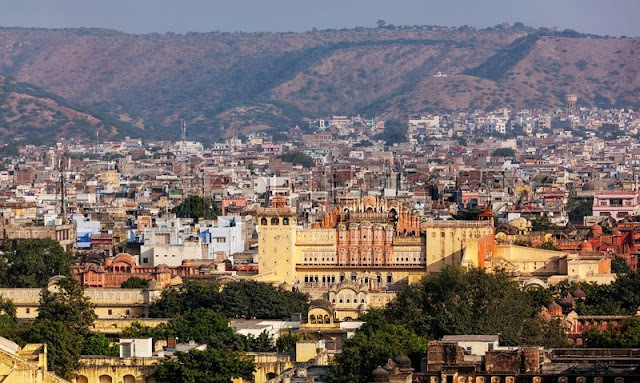 Jaipur - the city of victory got its name from its founder Raja Sawai Jai Singh. Besides being a great builder, he was also a great scholar of Sanskrit as well as Persian and had a deep interest in the field of Astronomy; to fulfil this, he built five ‘Observatories’ at various places namely Varanasi, Mathura, Ujjain, Delhi and Jaipur using masonry instruments of his own design which were as accurate as the brass instruments used by Newton, Flamsteed and other European astronomers at the time and when it came to building a new city from scratch he decided to plan it formally. His vision was futuristic & it can be seen by the amount of vehicular traffic it can behold in, in this advanced world of todays around three centuries later. He consulted Vidyadhar Bhattacharya for planning the city who was a scholar of Mathematics and Science from Bengal. 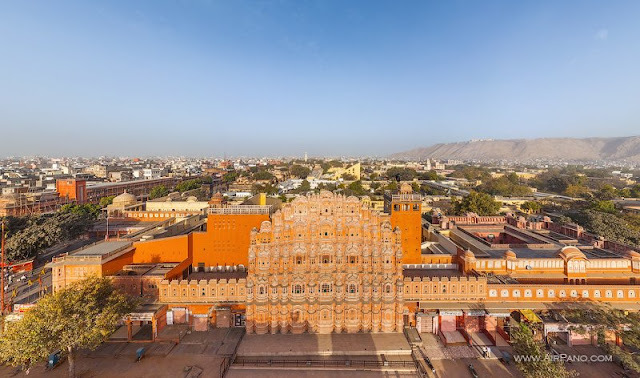 Vidyadhar referred to ancient Indian literature, books of Ptolemy and Euclid and applied them efficiently in the construction story of Jaipur. The city was divided into nine blocks, two of which consisted of the state buildings and the remaining were allotted to the general public to live in. To facilitate water supply to the new city, the Darbhavati river in the north was dammed to create the Jai Sagar and Man Sagar (that later housed the Jal Mahal) lakes. The city started expanding out of its walled boundaries in the 19th century with the arrival of Sawai Ram Singh II who adopted newer modes of technological development such as the railways. He introduced gaslights on the streets, modernised drainage system and piped water supply system. 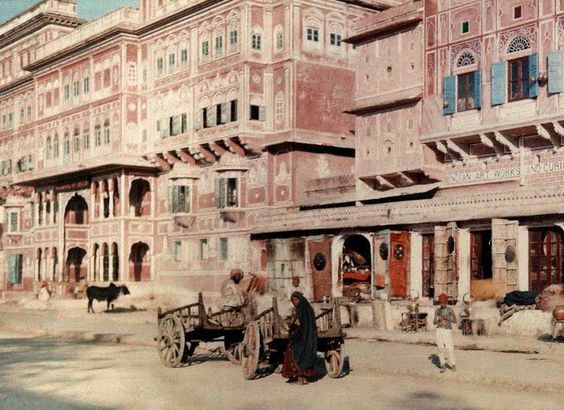 In 1876, when the then Prince of Wales was to arrive in the city, he decided to paint the city in pink (by virtue of which the city was later termed to as the Pink City of India) to offer a sense of welcome to him. The colour was chosen after several experiments to cut down the intense glare from the reflection of the blazing rays of the sun in an arid zone. 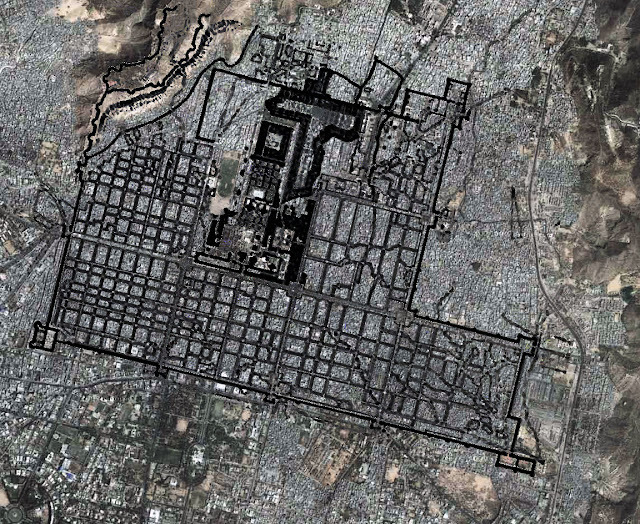 The expansion continued in the first half of the 20th century with the addition of different colonies outside the planned old city which were developed organically. With the arrival of freedom in India in 1947, the four largest Rajput states of Jaipur, Jodhpur, Jaisalmer & Bikaner were combined together to form the Indian state of Rajasthan with its capital at Jaipur. The city has experienced an accelerated developmental story since then. In 1900, the city’s population has reached 1,60,000 which doubled itself in the next 60 odd years. The population of the city over the last five decades has increased over ten times which was around 3,50,000 in 1970’s raising to over 3.5 million in 2016. The city is expected to cross the mark of 4.2 million by 2025 and is predicted to shift to the 10th most populated city of India by then. According to the data released by NEERI, 70% of the city’s water supply receives water with a high concentration of TDS or contaminated by bacteria or both. The city whose water supply was dependent on the surface water has now turned to its groundwater potential with 90% of its total water demand being taken care by the water below the surface. As per the Centre for Science and Environment the city specifically faces problems of congestion in the old city areas, vehicular pollution, poor public transport, inadequate pedestrian and parking facilities and needs immediate solutions for these issues. The city has somehow tried to retain its symbolism & flavour and the future planning stints shall deeply understand the needs and aspirations of the city both on the platforms of its historicity and its future. The city beholds in a very distinct and rich language of urban sciences and efforts should be made more intensely towards integrating it with the modern mode of development. The local anthropology is a special character of the city and it should be given a worthy place in the planning exercise. The vision with which the foundations of the human settlement were laid shall also be considered and a cohesive layer of modern development shall be deciphered. The city provides a classic example of a human settlement imbibing in itself its rich cultural heritage in nearly every parts of its boundaries and it should be understood well by the fraternity concerned with human urban development.